For Health and Safety Week at Riverview, students participated in several activities. They attended a K9 assembly and met Willy Wolverine. They pledged to be healthy and safe by signing their names on puzzle pieces. They showed their excitement for health and safety by dressing up each day. Mrs. Barnett’s AM class and Mrs. Jenson’s class participated the most and tied for the spirit award. Celebrating Red and Green Ribbon Week, Mr. Hanosek's class tied red ribbons together to make the sign "Be Safe." Be safe when taking medications. Read the labels, take the proper amount, and only take medication that is prescribed for you. Mrs. Barnett’s, Mrs. Rogers' and Miss. Hansen's classes were excited to have Mr. Rowley come in and read them an Otis book. They were able to listen to the fun story and answer some meaningful questions about the author's purpose. Gage and Kade Christensen were super excited because they were able to listen to their grandpa read the story to their classes. Thank you Mr. Rowley for taking time out of your busy schedule to read to our classes! We appreciate it. 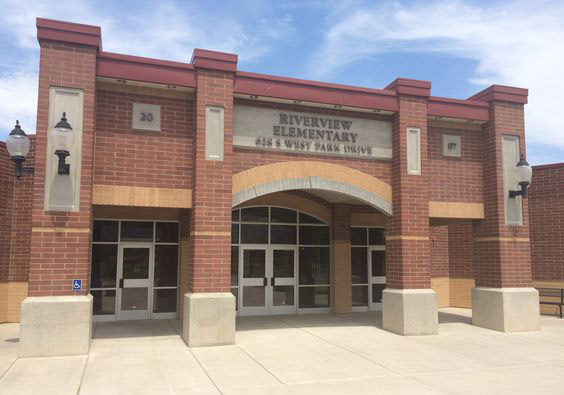 Riverview student council participated in an assembly for the Riverview Fall Fundraiser. Students will be selling Cherrydale Chocolate Bars and Jack Links Beef Sticks. The fundraiser began on October 1st and will end on October 14th. Our school goal is to raise $10,000. If we meet our goal, all students, regardless of student participation, will be able to participate in a school carnival. Congratulations for making student council! Top row from left to right: Dallin Pepper, Hesston Bishop, Luke Evans, Addision Urmston, and Sam Ashworth. Bottom row from left to right: Mckenna Penrod, Payton Jones, Bronte Matis, and Kate Bennet.